If you didn't know, I have an obsession with astrology. More importantly, I have an obsession with Mercury Retrograde. I guess it all started a few years ago when I started to see articles about Mercury Retrograde and began to take notice of how I felt during it. Soon enough, I was a tell-all book about this astrological phenomena because I found it so interesting that the planets could affect us this way. Mercury Retrograde makes communication, travel, and technology all wacky. They say to not make any major decisions, buy anything big (like a house or car), and to be aware that things may not be what they seem. 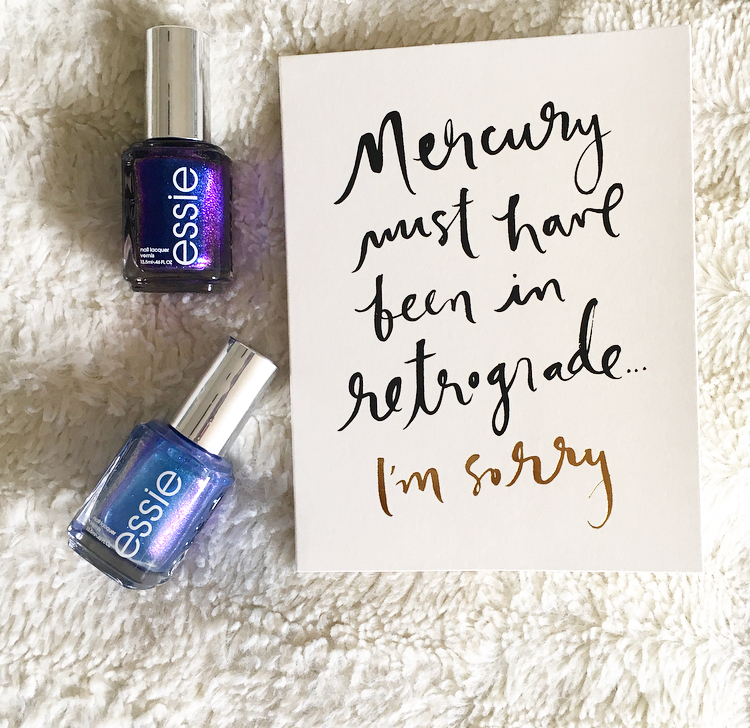 Mercury Retrograde has become very trendy over the past few years and now, Essie is jumping on the bandwagon. When I saw this collection tease on Essie's Instagram I immediately bookmarked the date in my calendar. I needed these nail polishes and I didn't care what colors they were. 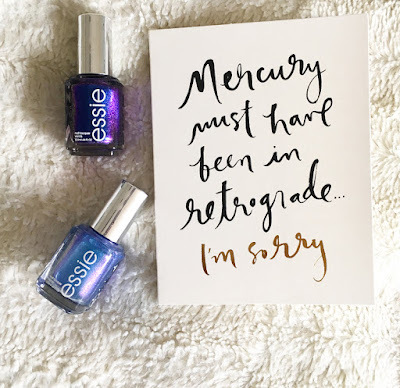 They were marketed as Mercury Retrograde colors and I am the retrograde queen (how many times can I say retrograde in one blog post). This is also another reason I am the ultimate consumer, but that's a different post for a different day. The Mercury in Retrograde Nail Collection consists of 2 nail colors inspired by intergalactic colors and they are gorgeous. Keep Calm & and Mercury On are the names of the polishes and they are truly astrology inspired. The collection is exclusive to Ulta and currently sold out. 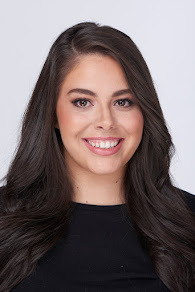 Essie has said that they are working to get a restock ASAP and didn't expect this overwhelming support of the collection. I am SO happy that I bought these the day they were released. I tried this color first as it was less intimidating; it's a pearlescent blue/purple shade that has a lot of holographic glitter in it. It's very beautiful and is the kind of color you can wear all year round. This is two coats of "Keep Calm"
However, I was surprised that when I applied it to my nails, it was incredibly sheer. I don't know if I've ever worked with a nail polish that was this sheer. I applied about 5-6 coats without clumping or disturbing the polish to get a nice, even and opaque finish. I don't think it was described as a sheer shade but it almost made me think that this was supposed to be a top coat color. This was really the only downside to the polish as it was really beautiful on the nails and didn't chip until 4-5 days later, which is normal for me with a good polish. Maybe the multiple coats really helped! I got so many compliments on this nail color because it really looked beautiful -- it glowed in the sun and flashed different colors, it's a very unique shade and I loved it. This is a color that I wouldn't have bought if it wasn't part of the collection but once applied, I'm actually really enjoying it. This is a deep purple shade with lots of blue glitters and a gorgeous blue shift to it. Essie describes it as a 'beautiful royal purple' and that is 100% accurate. And Mercury On is so much more opaque than it's counterpart; it applies like a silky dream and is definitely on the better side of Essie's formulas. Other than the opaqueness of 'Keep Calm' I am so happy with this collection! I love the trendiness of it, the accuracy of the colors and the feeling these colors give me. If you are an astrology lover, obsessed with Mercury in Retrograde, and someone who adores collecting limited edition products I highly recommend picking up both shades!